Today we released two significant improvements to Messages. If you're not familiar with Messages, it's a secure and private way for students and providers to communicate through StudyStays. It's an important tool for deterring and detecting scams, giving you greater ability to protect and assist students. You can read more about Messages here. Attachments sent via email are now collected by StudyStays and securely forwarded to the intended recipient. We had noticed sometimes students and landlords would exchange their real email addresses in order to send documents like lease agreements. That's still allowed, but it was an annoyance for users and it makes it harder for admins to investigate if issues arise later. StudyStays can now watch for problematic phrases used in messages and alert you when they occur. This can give you early warning of scams or abuse, without needing to look at every message that goes through the system. You can configure the phrases through Admin > Settings > Messages (if you have Super Admin permissions). When a phrase is detected, an alert will be added to the Admin overview page. You can review these alerts to see if any further investigation is needed, and dismiss the alert once the issue has been resolved. In late 2018, StudyStays began running automatic scam detection on all messages, looking for common scam phrases and unusual activity. So even if you don't use this feature there is still a base layer of protection. 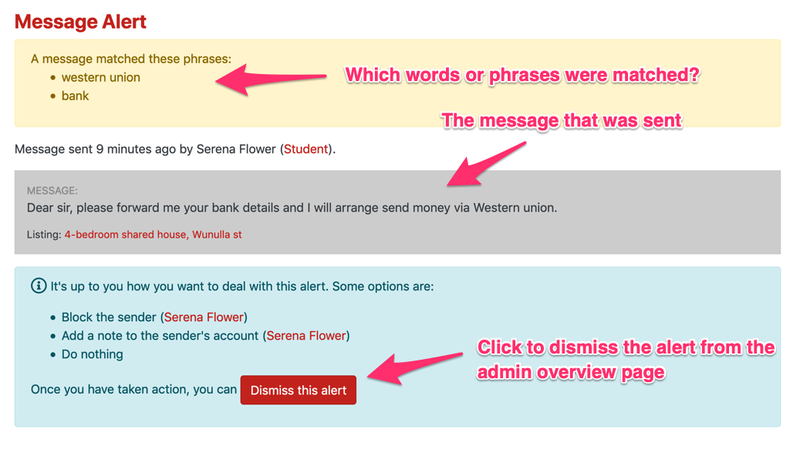 You can however, get more control and insight by configuring custom alert phrases for your own StudyStays database. Thanks Cat! It's great to hear this.